Festival Glass Beads There are 6 products. 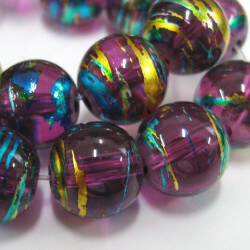 GB1867 - 10mm aubergine purple bead. Pack of 10. These are really pretty with splatters of gold and turquoise metallic colours. 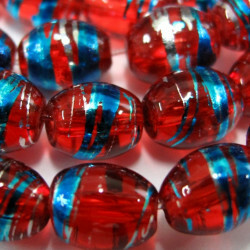 Red glass oval beads. Pack of 15. These are very pretty with splashes of blue and silver metallic colour. Size approx 8 x6mm. 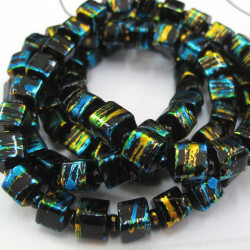 Long string of black festival cube beads. Long string of black festival cube beads. These are approx 7mm cubes with turquoise/green/gold decoration. The cubes alternate with seed beads. Approx 85 cube beads on the strand. 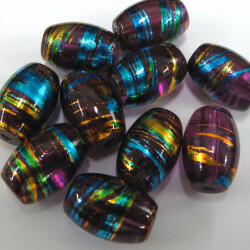 Oval Glass beads Approx. 14 mm by 10 mm. These are a Really Pretty. A Base Colour of Olive Green with a Splash of Turquoise and Gold in the Coating. Pack of 10. 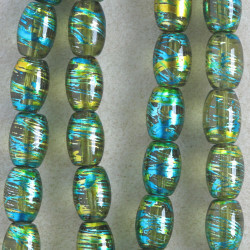 6mm festival beads, green glass. 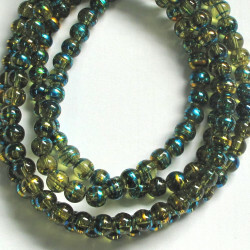 6mm festival Beads, green glass. These are a really pretty. A base colour of a mid, slightly olive green with a splash of blue and gold in the coating. Pack of 20.